On the morning of December 7, 1941, Japanese planes attacked the U.S. naval base at Pearl Harbor, Hawaii. The bombing destroyed battleships, airplanes, and more than 2,000 American lives, prompting young men all over the nation to volunteer for military service—including a junior at Dartmouth College by the name of James Gilbert '43. Jim asked his advisors to accelerate his studies so that he could enlist in the U.S. Marines. They obliged, and two days after graduating in December 1942, Jim and some of his classmates were on a train to boot camp. When he'd completed his training, Jim was deployed to the South Pacific, where he fought until World War II ended in 1945. 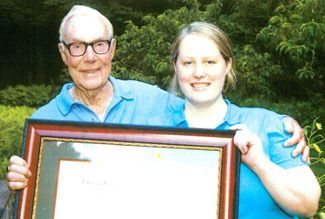 James Gilbert '43 and granddaughter Miriam Gilbert hold his newly reminted diploma from Dartmouth. Miriam surprised her grandfather with it after asking the Upper Class Dean's Office for a reprint of the original that was lost 65 years ago, when Jim graduated early so he could join the Marines. The education Jim received at Dartmouth and the skills he learned as a commissioned officer helped him lead a full, successful life of which his family is very proud, notes granddaughter Miriam Gilbert. have helped fund the educations of four children, fourteen grandchildren, and three great-grandchildren, and they never miss a graduation party. "But Grandpa would often joke, 'You know, I never graduated from college myself.'" Miriam wondered what he meant, and after a little digging, learned that her grandfather's diploma hadn't been ready when he graduated early. When the College sent the diploma after him, it was lost in the mail between the various training camps he attended. to surprise him with his diploma at the party. "I know that nothing would make him happier than to receive his college diploma from the school he loved so much," she wrote. The College was happy to comply with Miriam's request, and President James Wright included a congratulatory letter. Congratulations, Graduate! 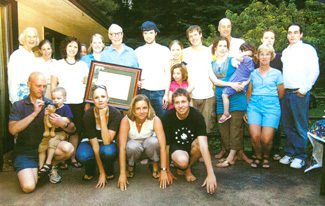 Jim Gilbert '43 and his family. "Family members traveled from as far as New Mexico to Connecticut for what we were secretly calling 'Grandpa's Graduation Party,'" says Miriam. "When the moment came, we gathered around a table with balloons and a graduation cake and surprised him with the diploma. "Grandpa was pretty much speechless. We read out loud my letter and the letter from President Wright, which really was the icing on the cake." A champagne toast rounded off the moment. With the barbeque going and the grandkids running around, says Miriam, "it was just like our family would do for any of our graduations — but a fun reversal of roles." What did Jim make of it? "I was quite surprised and touched," he says, "and it was great to have all the kids together." The day Pearl Harbor was bombed, Jim recalls, "I and a couple of frat brothers were at Smith College, visiting the girls we were dating — including Patricia, my wife of 60 years now — and it put a damper on the party, you can bet your boots. We knew something had to be done about it, and we thought we ought to be the ones to do it. So I never tried to find my diploma, because other priorities moved in." According to Miriam, Jim's years at Dartmouth were "some of the most exciting, proud years of his life." This veteran sacrificed some of his college experience to respond when his country needed him, but thanks to the determined efforts of his loving granddaughter, Jim Gilbert has had his graduation party at last. And his Dartmouth College diploma hangs on his wall.